For the very best in luxury RV trailer comfort, the Jayco Eagle Travel Trailer is one of the best buys on the market today. High end components, convenient upgraded features, and residential interior designs, plus a 2-Year Warranty make this upscale bumper pull camper an RV to be proud to show off. 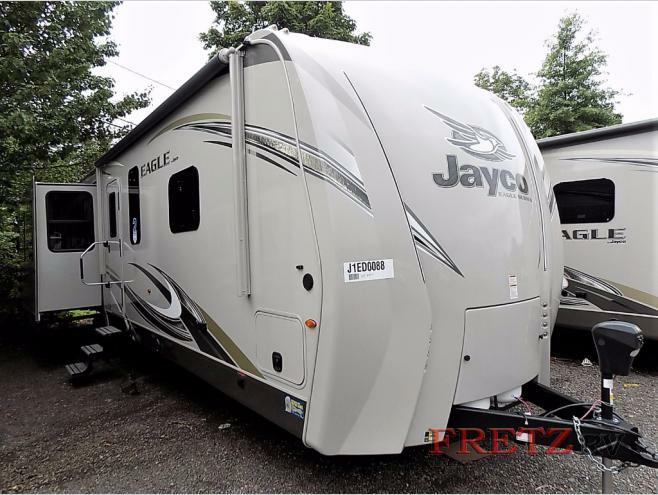 The Jayco Eagle Travel Trailers for sale at Fretz RV offers a number of unique features that set it apart from the competition. Here’s a close up look at what makes the Jayco Eagle fly high. Starting with the exterior, the Jayco Eagle Travel Trailer is built for excellence with a Tuff-Shell aluminum framed, vacuum- laminated, gelcoat fiberglass exterior walls and Magnum Truss roof system. The high gloss fiberglass front cap with specialty LED lighting is both attractive and wind resistant. The Eagle’s electric auto leveling jack system allows you to quickly and easily set up camp and establish stable ground. You will find large slam latch storage compartments all around the coach allowing you to bring everything you need with you on your travels. 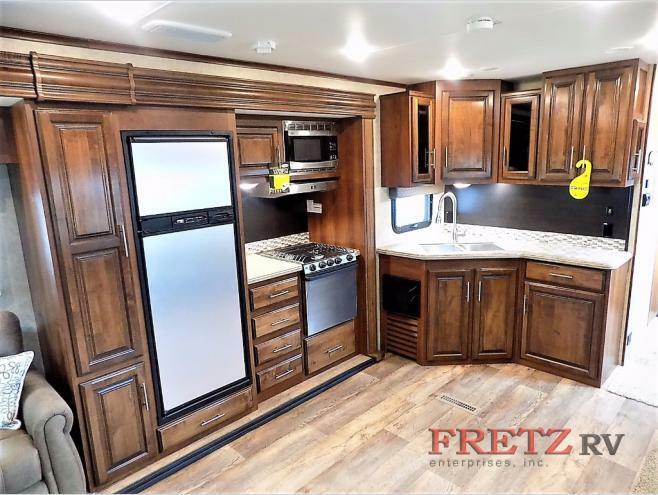 As you step inside the Jayco Eagle Travel Trailer, you are met with a residential ambiance that is warm and welcoming. 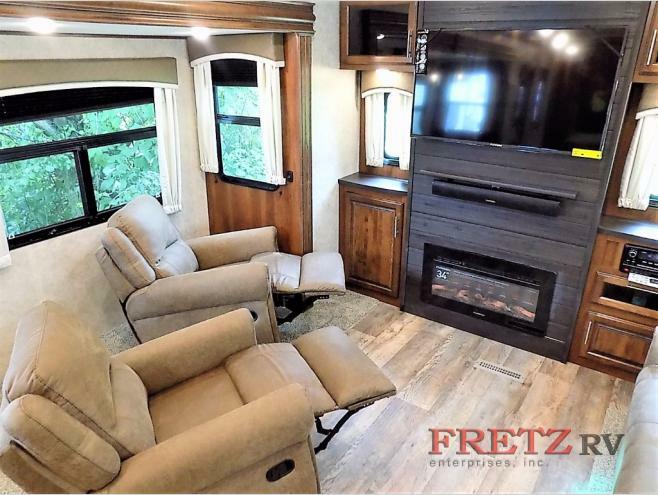 From the electric LED fireplace to the plush reclining seating to the expansive master bedroom, this cozy camper is an comforting respite after a long day of sightseeing and exploring. In the kitchen you will find LG solid surface counter tops, a stainless steel oven, sealed burner stovetop, an 8 cu/ft refrigerator with freezer and ample pantry and storage space. All throughout the coach, you will find quality materials that are built to last. 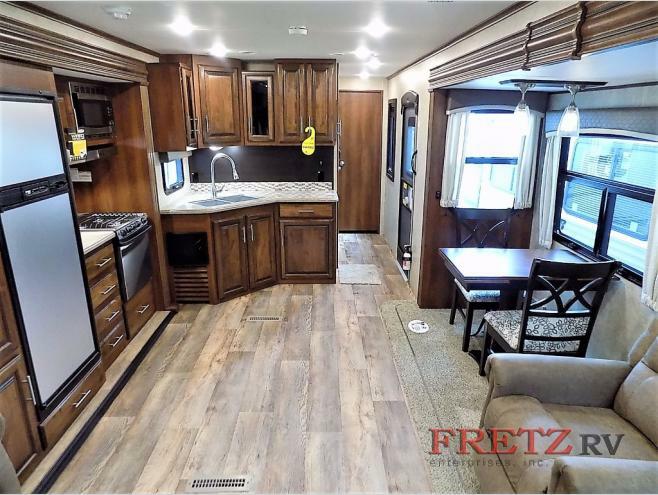 Handcrafted, “Sugar Maple” glazed, raised-panel maple cabinet doors, Shaw residential carpeting, and IVC Trekk “wood-plank” vinyl flooring ties the entire Jayco Eagle residential interior design together. 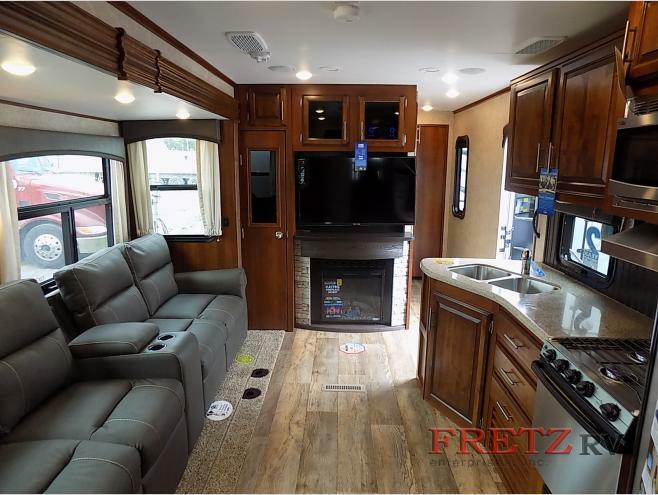 The Jayco Eagle Travel Trailer is also unique in it’s special attention paid to quality insulation, heating and cooling components. In the steamy summers, you will stay crisp and cool thanks to the “Whisper Quiet” 15,000 BTU central A/C unit. All Jayco Eagle travel trailer models have a long list of features to offer families and couples looking for a luxury camper to enjoy during travel adventures. 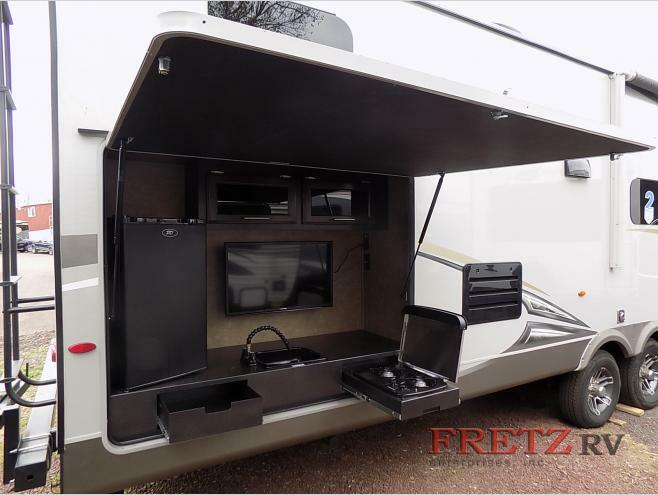 Contact Us At Fretz RV to take a personal tour of this quality travel trailer RV.